Arguably it is the act of speaking which distinguishes humans from other animals. Language, the most important human invention, has been a medium for creative expression. Literature, poetry, film and theatre rely on language to communicate ideas. Several artists too employ language in their visual art pursuits — the usage of text is perhaps the most obvious example. Throughout history, Quranic calligraphy has been a form of aesthetic expression in many Muslim cultures. Some artists have utilised the creative possibilities of the script in various manners. In Pakistan a leading exponent of this art was Sadequain, who may not have discovered artistic calligraphy but extended its concept and made it into a popular art form. His figurative paintings were conceived as works based on readable narrative. Other notable artists who have worked with script (both of religious and non-religious) are Hanif Ramay, Shakir Ali, Anwar Jalal Shamza, Gulgee, Ahmed Khan, Rashid Ahmed Arshad and Naiza Khan. 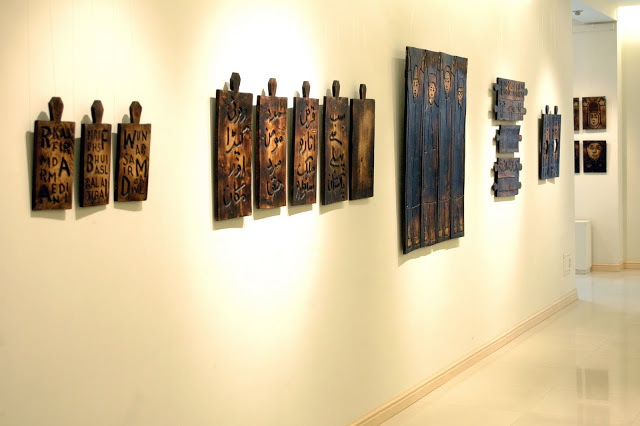 At first glance, Abdul Jabbar Gull, who is currently exhibiting at Ejaz Galleries in Lahore, lays emphasis on script. But a more careful examination reveals that his interest lies somewhere else — beyond the script, in the visual manifestation of language. In fact, language and not script is the main subject matter of his work. Jabbar does not attempt to write words in an aesthetically beautiful or even graceful manner. Words, whether carved or painted, are placed close to human figures in his reliefs, paintings and works on paper. The idea that language, the act of speech, is more important for him than the decorative potential of Arabic script is revealed in uniformity of text. Words, like shapes, are drawn in a simplified scheme, often resembling writings in Urdu, English and Hindi. But in reality these words (that look like characters) are meaningless — these only represent a form of speech. In this solo exhibition, Jabbar displays a total of 74 works — in oil, ink drawings, reliefs and freestanding wooden sculptures. He has painted, drawn, scribbled and carved letter/forms on works executed in diverse mediums. Human figures (both male and female) are depicted in majority of pieces with recurring features and particular characteristics. All of these seem to possess identical personality, with slight change in dress, sizes and positions (and strangely reflect the artist’s own features). These figures, mostly on painted canvases and in loosely rendered ink drawings are dressed in local attire — they are people from our surroundings, belonging to middle class, patriotic, religious and striving to survive in this society (described as ‘Ordinary Souls’ by Jabbar Gull in his catalogue). These men and women occasionally stretch their arms in an expressive gesture. The figures are portrayed in a clam and archetypical fashion (like people who quietly stand in front of a camera). The portraits, along with the works with full figures, suggest a sombre expression that is enhanced by placing them symmetrically in the middle of compositions. Jabbar’s wooden sculptures are highly stylised and are composed in different groups or orders. These are put in groups or in grid formations. The figures along with their faces are flattened to give them a uniform and elementary look (to the extent that they resemble pawns on a chess board). In fact, both painted figures and pieces in darkened wood share similar characteristic: of being identical, static and expressionless. This element, when juxtaposed with text poses a question, and at the same time signifies an important trait of our society. The combination of motionless figures and text (language) appears odd at first sight, but a closer look unfolds the people’s stance or fate of being speechless specie. Compared to people of other cultures, Pakistanis hesitate to voice their thoughts, problems and affinities. Most people prefer to remain silent, indifferent and aloof, or have learnt to remain mute after several years of state suppression and political corruption. It is this very creed of people that is of Jabbar’s primarily concern. His figure perform a ritual at a sacred site or circle around a desirable object/symbol, or in the prayer formation — acts that involve absolute silence. The focus on speechless individuals is also apparent in the frequent usage of writing tablet (takhti) through which people were introduced to learning years ago. In more than one works, these takhtis show human presence on two sides — outlines of figure in the front and lines of text at the back. (However the shape of human figures are carved much like a sketch, quickly drawn on a piece of paper — or like scribbling on a notebook). The relationship of humans with language and their incapability of expressing themselves reflect how aware the artist is about political issues. Such themes are dealt with in some other works too, but in a more direct manner, for instance writing down the political slogans or comparing the social groups with political/religious divides by making bearded and clean-shaven soldiers, individuals from each province, or people that represent different creeds and ethnicity shown through holy signs. Generally, a majority of Jabbar’s work suggests a serious issue — of speechless creatures. Quddus Mirza is an artist, art critic and independent curator. He is Associate Professor in Fine Arts at the National college of Arts Lahore. Trained as a painter from National College of Arts, Lahore and Royal College of Art, London, Mirza has shown extensively in numerous group and solo exhibitions. He has also curated a number of exhibitions including “Beyond Borders: Art from Pakistan," at National Gallery of Modern Art in Mumbai, India, and “Exotic Bodies,” based on miniature paintings from the collection of Victoria and Albert Museum displayed at Preston Museum in UK. 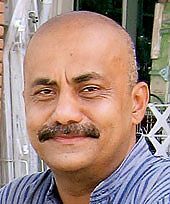 He currently writes in The News, he is the co-author of the Book “50 years of visual arts in Pakistan”, “The Rising Tide” and “Hanging fire”. His writings have been published in national and international newspapers and magazines.